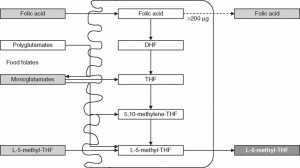 Isomers, Enantiomers and Activated Forms – Part 2: Folic Acid and 5-MTHF: What is the Real Difference Clinically? Those who have been following the trends over the past several years know that many functional medicine clinicians have been promoting the use of 5-methyltetrahydrofolate (5-MTHF) in place of folic acid; especially in patients with a known genetic predisposition for reduced folate methylation. It is quite common to hear speaker after speaker suggest that the use of 5-MTHF is necessary for clinical benefit and that the use of folic acid is useless or even harmful. But are these statements based on reliable evidence? We recommend clinicians use 5-MTHF supplements, perhaps together in a B-complex product, in patients known to be homozygous (TT) for the MTHFR polymorphism. We also recommend supplementation of 5-MTHF, or 50:50 blends of folic:5-MTHF, for prenatal patients, those who are suspected of poor methylation and when using very-high-dose folate products. These suggestions should not be viewed as a recommendation to avoid folic acid in these subjects, as current data suggests neither lack of efficacy or harm when using folic acid in these subjects. There is, however, sufficient data and mechanisms to prefer 5-MTHF in these patient types. Folic acid is adequate for multivitamins intended for the average healthy population, especially where cost may hinder the use of necessary supplementation. Why isn’t there a bigger difference in the clinical benefit between 5-MTHF and Folic acid in homozygous MTHFR TT individuals? This question stems from the fact that contrary to some expectations, the differences seen in clinical trials when using folic acid and 5-MTHF in these individuals is often, though not always, significant. First of all, for those not up to speed on the MTHFR language- the methylenetetrahydrofolate reductase enzyme is necessary as the terminal step in producing 5-MTHF- the active form of folate. In sequencing the gene for this protein, researchers identified that some individuals had a cytosine (C) at base pair position 677 (this is the most common), and others had thymidine (T) at that position. This is often referred to as MTHFR C677T polymorphism, and causes an alanine-to-valine amino acid change at the 222 position of the protein. This small change in the protein results in less-efficient synthesis of active folate compounds—some estimates are 75% less efficient. About 45% of individuals in the U.S. are homozygous for the normal variant (677CC), but about 10% may be homozygous for the other variant (677TT) and others (~45%) heterozygous (677CT) with both gene variants. These heterozygous, and especially homozygous TT, individuals often have noticeably less-efficient methylation, accounting for higher risk for certain diseases and a higher need for folate supplementation. While there is documented clinical benefit to using 5-MTHF in patients with the TT polymorphism (this is now a common test available from many laboratories), I believe the main reason there is not always a measurable clinical difference between 5-MTHF and folic acid is that oral dosing of 5-MTHF only compensates for the initial methylation of that “dose” of folate- which is only a small portion of the total body folate pool. Meaning, that whatever benefit in the increased 5-MTHF levels is derived from consuming 5-MTHF directly (as opposed to consuming folic acid)- it is still a small proportion of the total amount of folate already in the body, most of which would need to be re-methylated within the cells. While I still recommend the use of 5-MTHF in 677TT homozygous individuals or those suspected of poor methylation, the notion that folic acid does not work at all in these individuals is refuted by nearly every trial published. Even when the 5-MTHF is statistically better than the folic acid (as it often is)- both agents are significantly (statistically and clinically) better than placebo at raising RBC folate levels and reducing homocysteine levels. If they were the same cost to the user- we might choose 5-MTHF all the time, but there is a big difference in cost between these two (see below). 5-MTHF is natural and folic acid is synthetic- right? Again, this is another common misunderstanding about folates. While it is true that natural dietary folates are often in the 5-methyltetrahydrofolate form- most of these dietary folates are also naturally polyglutamyl molecules. Folic acid, on the other hand, is a monoglutamate molecule that is fully oxidized (no hydrogens attached to the ring structures). 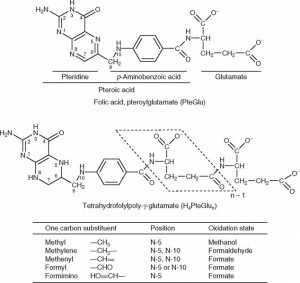 Natural folates are usually partially or fully reduced (dihydro- or tetrahydrofolate, respectively), and are substituted at the 5 or 5,10 positions with methyl or other groups (see figure below) and have up to 7 or so glutamate molecules attached (polyglutamates). Due to various factors, especially the need to deconjugate polyglutamyl dietary folates, synthetic folic acid is usually considered to have approximately twice the bioavailability as dietary folates. When the Food and Nutrition Board set the Dietary Reference Intake (DRI) levels for folate (using dietary folate equivalents- DFEs) they determined that 1 mcg of folate from the diet is equal to 1 DFE, while 1 mcg of folic acid in supplements was equal to 2 DFE. When folic acid is added to foods via fortification, 1 mcg is equal to 1.7 DFE (this takes into account some anti-folate activities in foods). What about 5-MTHF from supplements? The 5-MTHF used in medical foods and in dietary supplements (either the calcium or glucosamine salt forms) are not derived from “natural sources” and are not, as some describe them- true dietary folates. 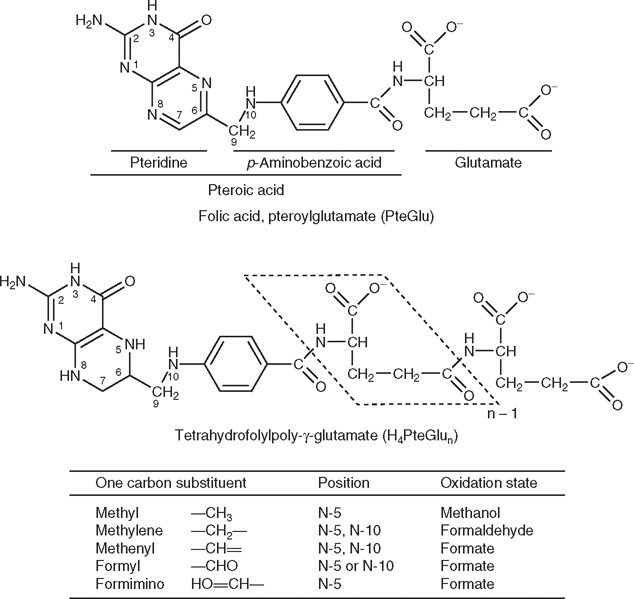 These compounds would be considered bio-equivalent (or bio-identical) synthetic analogs (5-MTHF, when naturally found in foods, is mostly in a polyglutamyl, not monoglutamyl form). Commercially available 5-MTHF is organically synthesized using folic acid as a starting material. After reduction to tetrahydrofolate and methylation- a racemic mixture (R,S) of a monoglutamyl 5-MTHF is formed. Crystallization and separation of the two stereoisomers allows for a purified S-form, which is then stabilized using calcium or glucosamine ions (the “S” describes the specific stereochemistry at the #6 carbon; this is often also called the “L” form due to the way this isomer reflects light). This process results in a raw material that is about 200 times more expensive than an equimolar amount of folic acid. The arguments against folic acid- How strong is it? Before getting into the details here, it is important to recall that purified 5-MTHF ingredients have only been available for about a decade or so (calcium salt) and only more widely available to use in a variety of formulas for about five years (when the glucosamine salt became available). This means that most of what we know about folates (positive and negative) have been performed using folic acid and the data using 5-MTHF alone or in comparison to folic acid is still being researched. Even so, in addition to the need to convert folic acid to 5-MTHF already discussed above, there are other reasons often cited for avoiding the use of folic acid. 1. Folic acid can mask (not cause) a vitamin B12 deficiency. Large doses of folic acid, typically more than 5 mg, given to an individual with an undiagnosed vitamin B12 deficiency could correct the symptoms of megaloblastic anemia without correcting the underlying vitamin B12 deficiency, leaving the individual at risk of developing irreversible neurologic damage. While definitive data is lacking, there appears to be some evidence that the use of 5-MTHF use is less likely to mask these B12 deficiency symptoms. However, since most functional medicine clinicians are aware of (and test for) vitamin B12 deficiency and most high dose folic acid and many 5-MTHF products are formulated with added vitamin B12- the issue of folate masking is rarely seen in the clinic using high dose folate therapies. We always suggest 500-2000 mcg of vitamin B12 should be included in any product containing 800 mcg or more of folic acid or 5-MTHF. 2. Un-metabolized folic acid. As we mentioned, while nearly all of the folic acid consumed orally will be converted to 5-MTHF prior to circulation, some folic acid does passively absorb prior to conversion. While it is now common for researchers to look for unmetabolized folic acid levels in the serum of folic acid-supplemented individuals, there is no clear evidence of a demonstrable negative consequence for these elevated levels or a proposed mechanism involving negative outcomes. The paper below covers most of the issues related to unmetabolized folic acid. Obeid R, Herrmann W. The emerging role of unmetabolized folic acid in human diseases: myth or reality? Curr Drug Metab. 2012 Oct;13(8):1184-95. So our position is that while the use of 5-MTHF may have some benefits over the use of folic acid, the much higher cost of pure 5-MTHF over folic acid requires that we reserve its use when it will be more likely to add value to the user. 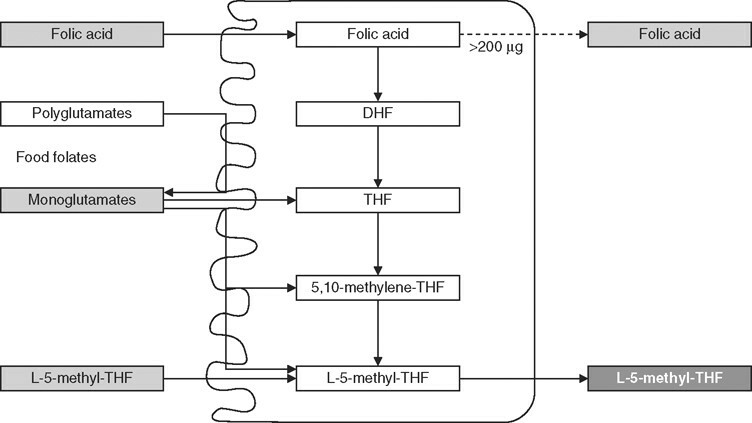 Since the data do not suggest folic acid to be harmful (compared to 5-MTHF) and clinically useful in most situations- the use of 5-MTHF should be considered mostly for those individuals with MTHFR polymorphisms that result in lower methylated folate. When using either folate compound above 800 mcg/day, additional vitamin B12 should be added to the regimen or formula. If you find this information helpful, you may be interested in our new book- Supplementing Dietary Nutrients- A Guide for Healthcare Professionals. To get Dr. Guilliams’ earlier book, The Original Prescription– you can purchase directly from the Point Institute or purchase on Amazon. When Merck first allowed certain supplement companies to use their form of 5-MTHF, they permitted various blends of 5-MTHF, folinic and folic acid. They quickly learned that some of these companies used a very small amount of the 5-MTHF (for window dressing) while most of the label claim was coming from folic acid. Merck apparently didn’t like this outcome and later would not permit other companies to mix folates. They also had a minimum dose policy in place. At that time, Merck would tell potential clients that the real reason for the “no-mixing” policy was that folic acid inhibited the absorption of 5-MTHF. We are unaware of any data that would confirm such a claim and, in fact, it appears that 5-MTHF absorbs as well or perhaps even better than folic acid. In any case, unless the dose amount of the combination of the two overwhelms the capacity of the monoglutamyl folate transport capacity (which is usually beyond their therapeutic capacity), the issue is likely a non-issue. Thankfully, there is another manufacturer of a purified form of 5-MTHF that does allow for the creation of blends as we suggest may be a good idea. Of course, if there is credible data to suggest interference between these two compounds in a way that hinders their respective therapeutic benefit- we would be glad to review it and consider altering our recommendation.